Robbery is the taking or attempted taking of anything from another person by threat of force, violence, or by putting the victim in fear of immediate harm. In 2016 alone, over 7,000 robberies were reported in Michigan. Of those 7,000 crimes, a significant portion were unarmed robberies. Unarmed robbery, in contrast to armed robbery, is a taking or attempted taking without the use of a dangerous weapon. If you’ve been charged, or believe the police suspect you of unarmed robbery, please contact Michigan Justice at (586) 221-4100. Our firm’s lead criminal defense attorney, Goran Antovski has had many cases for and with the Michigan County Prosecutor’s Office and possesses insider knowledge which he uses to secure the best possible outcomes for our clients. First, that the defendant assaulted with force or violence. There are two ways to commit an assault. The defendant must either have attempted or threatened to do immediate injury to another person, and was able to do so, or the defendant must have committed an act that would cause a reasonable person to fear or apprehend an immediate battery. Second, that at the time of the assault the defendant intended to commit robbery. 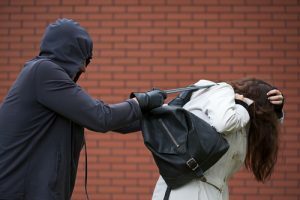 Robbery occurs when a person assaults someone and takes money or property from them, or in their presence, intending to take it from the person permanently. It is not necessary that the crime be completed or that the defendant have actually taken any money or property. However, there must be proof beyond a reasonable doubt that at the time of the assault the defendant intended to commit robbery. There are two separate laws in Michigan that directly deal with unarmed robbery. They are: MCL 750.530 and MCL 750.88. A conviction under either of these laws for an unarmed robbery charge could send you to prison for up to 15 years. Unarmed robbery charges are very serious and so are the penalties if you’re convicted—you could spend up to 15 years in prison. At Michigan Justice, we fight for our clients using comprehensive and thorough criminal defense strategies. If you need assistance, please don’t hesitate to contact us at (586) 221-4100. It is important that you have a lawyer ready to protect your rights and your freedom.